It's a PEN. It's a Flashlight! PERFECT for Field Day operators, pilots, nurses... anyone who has to write in the dark! LIGHTS UP. 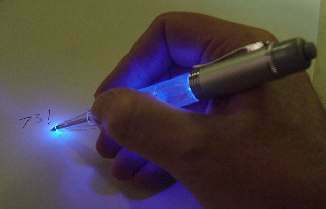 One quick click, and your pen lights up, so you can write in the dark, and see what you're writing. The LED is lens- focused to give you plenty of light where you need it, without disturbing others. REMOVE the pen section from the front and you have a neat little LED FLASHLIGHT. and really enjoy...night and day. Platinum color barrel with clear body and colored light. The LED Pen includes batteries. Pen refill available. PERFECTLY PRICED, too, at $5 -- compare to the same pen for $10.00 or more elsewhere! Single color LED pens are available in Red, Blue, Green, Yellow, Purple, Pink, and White. New RAINBOW pen-- set it for any of the seven colors, or cycle through them automatically!